"I once was a man, much as you are; no longer. I took my reflection, and shattered its face. You think you know loneliness? You think you know doubt? Well, allow me to demonstrate." The shadowcasters are fools, watching but never taking. This one has no such reserves. There are three maxims, known by all Bemäntelter Schatten; these are taken as truth, and all other truths as mere shadows of: These are lies, there are no truths, no lies. To categorize is to destroy. 1. The shadow and the reflection of a thing is a truth of that thing.Take from me these weaknesses. 2. To change the image of a thing is to change the substance; Shadow and Reflection are one.Ignorance is bliss. Knowledge is a tyranny of the image; to know is to be defined. 3. As long as image persists, Death is a mere illusion.Come, join this one. There is purity in disbelief, strength in being the flow. Ability Scores: Charisma and Wisdom are important ability scores... And then the first mind was born. Starting Age: As BardWith thought, came boundaries, slashed across virgin void with abandon. Alignment: Cannot have Blue as any part of their alignment.This mutilation of reality was abhorrent. Starting Gold: As Rogue.My journey is one of healing, becoming, within myself, what the world once was. The end. Wasn't that lovely? Skills 4+int (x4 at 1st level). The Class Skills for a Bemäntelter Schatten are Autohypnosis (Wis), Bluff (Cha), Concentration (Con), Craft (Int), Intimidate (Cha), Knowledge (any) (Int), Knowledge (Forbidden Lore) (Int), Psicraft (Int), Profession (Wis), Sense Motive (Wisdom), and Spellcraft (Int). Hit dice: d8Why don't you join me. Come, let us become gloriously nothing. Weapon and Armor Proficiencies: A Bemäntelter Schatten is proficient in simple weapons, but is not proficient in any armor. However, that one is proficient in the shadows upon its foe's heart. Fundamentals of Shadow: The powers of one who seeks the knowledge to make themselves whole must first start at the most basic of abilities; this manifests as at-will spell-like abilities called Fundamentals of Shadow, drawn from the shadows covering the hearts of all things. A Bemäntelter Schatten begins play knowing a single Fundamental; they gain knowledge of another Fundamental at 6th level and every 4 levels thereafter. What are these lies about knowledge? Those who know are ignorant, as they divide into the "known" and "known not". Supernatural : At 10th level, all Fundamentals of Shadow that the Bemäntelter Schatten knows are treated as being either spell-like abilities or supernatural abilities, whichever would be better. Manifestation of Shadows: The shadows know those who wish to become whole; they lend their knowledge to those who wish to know. No! Division is poison. A Bemäntelter Schatten knows a number of Mysteries, as indicated by the above table; they select Mysteries from the Shadowcaster's Mystery list. They may only learn a Mystery of up to the level indicated on the above table. Unlike pathetic shadowcasters, who beg the Place for power, they derive power from shadows within their self; as a result, they are not required to learn mysteries sequentially within a path; instead, they may learn any Mystery of up to the listed level that they please. In addition, they don't have the failings that others have when using the power of shadows; their mysteries are instead manifested as if they were Powers of their level; as a Bemäntelter Schatten wears their shadow as a cloak, the discerning sign of shadowcasting, the differing gestures of the shadow, does not exist. Indeed, nothing does; all is one, and one is nothing.If every mystery in a Path is learned, then all of those Mysteries become Psi-like abilities, and their manifesting level is increased by two. However, they do not lose those points to the aether; instead, the power of shadow fortifies them, granting them a number of Temporary Hit Points equal to the number of points spent; these Temporary Hit Points stack with any other Temporary Hit Points they would gain through their Manifestation of Shadow, and cannot cause the Bemäntelter Schatten hit-points to be higher than their Maximum hit-points. They gain a number of bonus Power Points based off of their Wisdom modifier. The save DC for a Bemäntelter Schatten's mysteries is (10+mystery level+Charisma modifier.) They require a Wisdom score of at least 10+Mystery Level to use a given mystery. 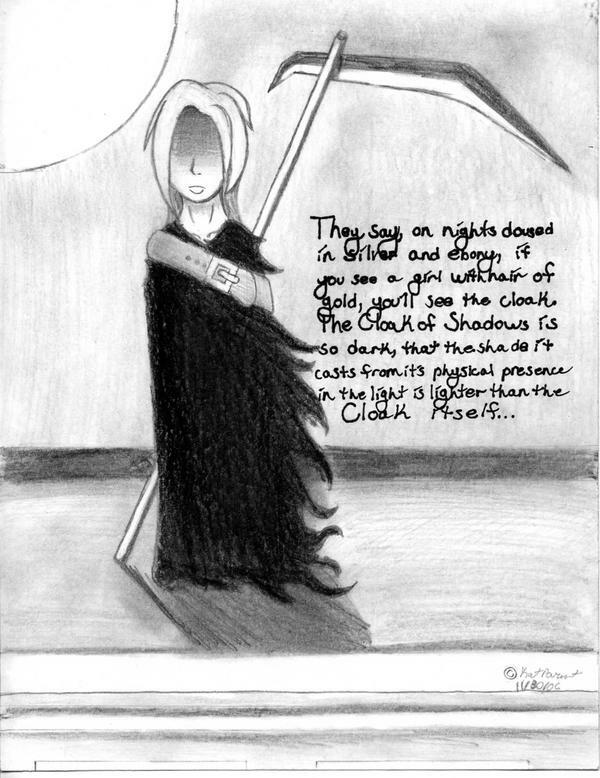 Mantle of Shadow (Ex): A Bemäntelter Schatten has drawn their shadow around them like a cloak, allowing it to permeate their being as it should, lending them a grander power than their mere mystery-using compatriots. 1st Level : They do not need to eat or drink to live. 3rd Level : They no longer have a need to eat, drink, or sleep. 5th Level : They no longer need to eat, drink, sleep, or breathe to live. Joined with Memory: Pity the vestige, that being that has been reduced and exalted to an image of itself. To one who has fractured their image, replacing pieces with that of another is a simple task, almost one for a child. At 2nd level, and every 3 levels thereafter, a Bemäntelter Schatten may learn a vestige as a Mystery of equal level. However, the connection to the Vestige itself is far more tenuous than that of a normal bind; it takes a full-round action to manifest a Vestige learned through this ability, the pact only lasts for a number of minutes equal to their Manifester level, and they are always treated as if they made a bad pact. Their EBL is equal to their Mystery-user level. Naim, a 5th level Bemäntelter Schatten knows two Vestiges as Mysteries. In his case, he chose Naberius (which is now a 1st level Mystery) and Savnok (which is now a 2nd level Mystery); he can enter either pact as a Full-Round action, and would gain the benefits and drawbacks of making a bad pact with that Vestige for the next 5 minutes. A Bemäntelter Schatten may only choose a Vestige of up to the highest level of Mystery they may learn to be learned through the ability. Come, brethren, I give you a stepping-stone back. Love me, for I am you. Fracture the Image (Su): A reflection is not a reflection; it is one and parcel to the reality of the thing it reflects; to mutilate one's image is to set one's self free.A trap a trap Oh gods this one didn't know. Hidden : The breaking of the Bemäntelter Schatten's reflection has led to the steady degradation of their physical image. They gain a miss chance as if due to concealment equal to 1/2 of their Class Level *5%. I see beyond now liberate me from here. Travel : Their self-image cracked yet further, they break some of the bonds that hold them from walking wherever they wish. Whenever the Bemäntelter Schatten moves, they may treat any normally impassible terrain as if it were Difficult Terrain; this includes such actions as walking up or through walls, walking on water, or even walking on the air. However, they must remain adjacent to an open space for the entire move, and must end their move action on a solid, horizontal surface.Why punish me GIVE ME BACK THE WALLS OF MY CELL! RETURN MY PRISON, DAMN YOU! Wholeness : Life and death themselves do not know what to make of them; at this point, the Bemäntelter Schatten gains the Rejuvenation ability of a Ghost, and thus are incapable of truly dying; however, should they be targeted by an effect that would destroy or imprison their soul, they do not Rejuvenate, at least until their soul is released from its prison. As a result of the above, they no longer age, and do not die when they reach their maximum lifespan.Ich habe ins Leere starrte, und ich wurde es, beachtet auch meine Fehler und lerne aus meinen Fehlern. Ich bin kein Modell, sondern nur eine Verirrung. Die Heilung ist fehlgeschlagen. At 4th level, a Bemäntelter Schatten adds their Charisma modifier to their AC as a Deflection bonus. In addition, they may apply Armor Special abilities to their shadow that collectively cost as much as the listed Enhancement "bonus". They only gain the benefits from this class feature as long as they are not wearing any armor. At 9th level, a Bemäntelter Schatten gains the ability to Hide even while being observed, as long as they are within 100 ft of a shadow. Darkhidden Cloak (Ex): As they recede even farther from reality, they become harder and harder to detect. At 13th level, a Bemäntelter Schatten gains Darkstalker as a bonus feat; if they already had that feat, they may choose another that they qualify for. In addition, any time that a creature attempts to use a Divination ability, Clairsentience power, or any similar spell, Spell-like, Psi-like, or Supernatural ability on either the Bemäntelter Schatten or the effects of any Mystery they have manifested, they must make a Will save against a DC of 10+1/2 their Bemäntelter Schatten level+their Charisma modifier, or they are completely and utterly incapable of detecting the Bemäntelter Schatten, or any of their created effects, through the use of that ability or similar detection abilities for the next 24 hours. Here is a little "Hi, everyone!" offering; a class I posted a while ago on the GitP forums, now having been fixed up (I removed about half of the confusing mind-screw), with one ability vastly simplified and three more being added. Last edited by Amechra on Fri Oct 28, 2011 1:23 pm, edited 3 times in total. Reserved for feats, and maybe an ACF or two. Nice use of the tabs command; that thing is awesome. I'm going to add a [secret] tag to hide text for you, so it'll work on all skins and even when you quote/spoiler/whatever things. As for the actual content, I really like the Preternatural thing: I used a similar concept with my Shadow of a Murder, but a lot of people complained about "extraordinary magic" — a new term helps, I think, and Preternatural is perfect. Do you mind if I steal it? I'm confused by their "mysteries known" progress; the text doesn't seem to match the table (and is, in any case, confusing). Also, am I to assume they use the Shadowcaster's Mystery List? You should say that. I vote that you just give them Power Points; the Shadow Reserve is (as far as I can tell) identical, and it takes a minute to recognize that. Besides, most Psionic feats require at least 1 PP, which this class doesn't grant (even though they may make good use them). All that said, though, I think switching to Power Points was an inspired move; it really does make Shadow Magic work much better, IMO. The temporary HP thing is weird. Do those temporary HPs have a duration? Do they stack? 'Yes' should probably be the answer to both questions, but the text as written has a 'no' to both. Mantle of Shadow's fine; no real comment on that. Joined with Memory is awesome; I really like that. However, 'learn' a Vestige? That... doesn't really make sense. I assume that they have full access to all Vestiges? Hidden should probably say something like "miss chance as if by concealment", or something. As is, it is kind of ambiguous as to whether or not it counts as concealment for the purposes of Hide (I am assuming, for the moment, that it is not intended to, since they gain HiPS at 9th). Travel... I don't particularly like those effects in my game; they're a headache for a lot of DMs. One of my favored solutions is to limit them to requiring them to remain adjacent to an open square at all times; this allows them to pass through 10' thick walls, but not completely go around a dungeon, for example. Still, your version does have several important restrictions and is a really cool ability; I'm not sure if another restriction is warranted. Something to consider, anyway. Mind... I think it'd be better to just say "immune to mind-affecting effects" or something; Mindless implies a lot of things that get weird (for instance, while avoiding an Enchantment, is the character not allowed to think? Does a mindless thing know to use this ability to go back to being mindful? Body is just a bad idea, from a rules standpoint. There is no other feature that allows them to do that, and an enormous number of things either ignore or simply don't account for the possibility of a dangerous object like that. I strongly recommend that you change this to say, Incorporeality. Fool's Shadow seems to imply that the Bemäntelter Schatten cannot or does not wear armor; the feature is kind of confusing if they do. However, the rest of their features do not prevent them from using armor; they need to pick up proficiency or eliminate the ACP (but both are easy), but all their features work. If you do want them both to work, you need to clarify how the special abilities on the shadow and on any armor you may be wearing do or don't stack. Also consider that the feature may be more powerful than intended (because it not only gives those abilities free, but it also effectively makes the abilities on the armor cheaper). This may not be overpowered, but it is worth considering if you haven't. In your HiPS, it's worth noting that the vast majority of the HiPS out there put some conditions on its use (see Ranger, Shadowdancer). Also, just to be sure: it is intentional that your version of HiPS still requires the Bemäntelter Schatten to have concealment/cover, correct? As written, it does, but some versions of HiPS remove that requirement as well (e.g. the Shadowdancer). Also note that most versions of HiPS that eliminate the need for cover/concealment are Su. Considering that the Bemäntelter Schatten is Psionic, you'd think Darkhidden Cloak would work on Clairsentience effects... Anyway, good feature. Overall, I think this is a pretty good class. I'll clarify a bunch of the stuff later Tonight. And, yes, Wholeness is meant to make you immortal. Death itself has NO CLUE what to do with you. Hrm. Ultimately, I don't know that I care for that, but whatever; 19th level is ridiculous anyway. I'll read-through, but a changelog would be appreciated. Also, I added that [secret] tag for you; it'll hide your text against... most backgrounds. If you specifically highlight an area, that won't work, and I haven't updated the non-default skins yet (that all of 3 members are using...), but it'll cover the uses you have here. You should update the Mystery Level/Shadow Reserve Cost to use Power Points... or rely on the defaults for those things, maybe. Otherwise, the other updates (Joined with Memory, Travel, Mind, Body, Fool's Shadow, HiPS) all look good. Darkhidden Cloak now works on Clairsentience Powers, but not on Psi-like Abilities, which is odd. Psi-like abilities are spell-like abilities. In several Monster Manuals, there are creatures with abilities labeled "Psionics (Sp)", but XPH defines a separate ability type "Psi-like Ability (Ps)", which has separate rules. See here for details. They have a special caveat in that they can use Empower Spell-like Ability and Quicken Spell-like Ability, but generally speaking, despite being "very similar to spell-like abilities," psi-like abilities are "still psionic in origin" (even when duplicating the effects of spells that are not also powers), meaning things that do differentiate between Spells and Psionics (as Darkhidden Cloak would) would not affect them. Also, if XPH is in play, all creatures that have "Psionics (Sp)" are instead considered to have a series of (Ps) abilities instead.